Total 2015 defense revenues for the Top 100 companies came in at $356.7 billion, down more than 7 percent from the 2014 Top 100 total of $385.8 billion. The top 25 companies accounted for 73 percent of total defense revenues in the year, and the Top 10 firms accounted for 54 percent of total defense revenues in the year, an improvement from the last two cycles, which saw that percentage drop a point each in 2013 and 2014. 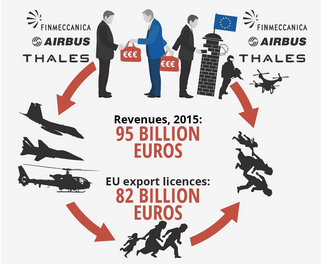 The report (pdf), Border Wars: The Arms Dealers Profiting from Europe’s Refugee Tragedy, released jointly by the European Stop Wapenhandel and Transnational Institute (TNI) on Monday, outlines arms traders’ pursuit of profit in the 21st century’s endless conflicts. But Cerberus is also very big in guns. It is run by people for whom everything is just business, from firesales to firearms, from Irish property deals to selling weapons of war to anyone who wants them. The connection between Belfastand Orlando reminds us of a truth that is easily forgotten – behind every mass shooting by a deranged psychopath in the US is a very profitable industry owned by Ivy League graduates with clean hands and manicured nails, respectable people who fund politicians in Congress and host charity galas inManhattan. If they had a slogan it would be the old Roman adage, pecunia non olet – money has no smell. “Was Bill Clinton’s expansion of NATO — after George H. W. Bush and [his Secretary of State] James Baker had assured Gorbachev and then Yeltsin that we wouldn’t go an inch further east — was this for Lockheed Martin, and Raytheon, and Boeing, and others, to increase their network of potential weapon sales?” Wilkerson asked. “You bet it was,” he answered. “Is there a penchant on behalf of the Congress to bless the use of force more often than not because of the constituencies they have and the money they get from the defense contractors?” Wilkerson continued.